Private and serene, Motswari Game Lodge offers luxury safari accommodation and an authentic African bush experience in the land of rare white lions. Ideally situated and exclusive, Motswari is located in the heart of Timbavati Private Game Reserve, which forms part of the Greater Kruger National Park and plays host to Africa’s Big Five. Within the two hundred square kilometres that make up the Timbavati bushveld, guests will observe diverse wildlife in their natural habitats as part of an unforgettable experience of Southern Africa. Motswari's charm is its family-friendly ambiance, expansive views, scenic drives and safari walks through game rich areas, exploring the untamed splendour of Africa. Motswari’s motto of ‘come as a visitor - leave as a friend’ stands as a true declaration of its character. Motswari (which means ‘to serve and protect’ in the Setswana language) only caters for a total of thirty guests at a time, ensuring that guests can escape from modern stresses in a relaxed safari environment and enjoy Southern African hospitality at its best. Timbavati Game Reserve is located to the north of the famous Sabi Sands Game Reserve and to the west of Kruger National Park, and is a much treasured getaway destination. As the proud home of indigenous white lions, which were reintroduced into the area in 2006, and with more than forty individual mammal species and almost four hundred bird species, guests are guaranteed an authentic bush adventure. There are extensive populations of all members of the Big Five, giraffe, cheetah, zebra, wild dog and hyena, and over a hundred listed species of reptile and fish. Exciting day and night game-drives and guided walking safaris through the savannah with an armed ranger provide an unforgettable game viewing experience for guests staying at Motswari. Night drives allow guests to see some of the more elusive nocturnal African wildlife such as hyena and leopard. Mobile camping in the Giraffe’s Nest Hide is also available for avid bush lovers at Motswari. This is for a maximum of four guests at a time and is a unique feature in the South African reserves and a great addition for those looking for a more active experience. 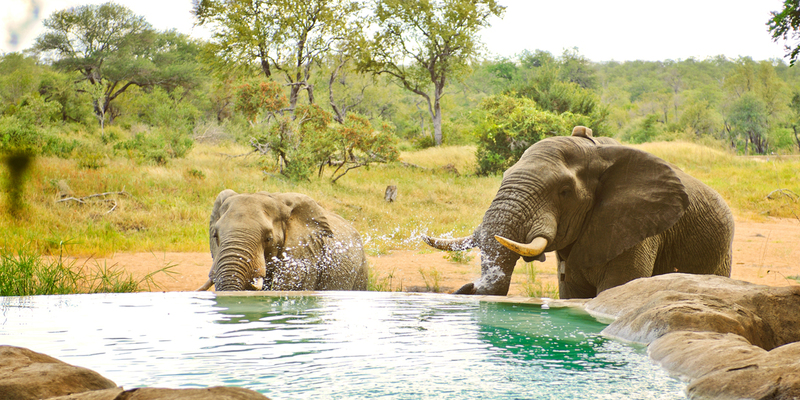 In between bush activities guests can relax by the pool or choose a spot on the deck and watch wildlife at the waterhole. The library offers an interesting selection of African books, while the art gallery boasts a beautiful collection of local artwork constructed of wood, bone and stone. There is a local sculptor who practises his art and sells sculptures inside the reserve. Motswari also features a fully-equipped conference facility for executives making use of the lodge for team-building, product launches or corporate getaways. There is an internet hotspot available for those wishing to conduct business during their stay. Overlooking the Sohebele River and neighbouring waterholes, Motswari’s fifteen individual bungalows offer a superior level of comfort with luxurious en-suite bathrooms and stunning views of the surrounding wilderness. Each elegantly appointed bungalow features air-conditioning, overhead fans, naturally-furnished interiors and mosquito nets draped over comfortable four-poster beds to provide a romantic ambiance. Motswari prides itself on its collection of local art and sculptures made out of natural materials and inspired by elements of nature, some of which are for sale at the art gallery. Motswari’s main lodge features a spacious lounge area with fully licensed bar where guests can relax with a drink after a long day in the bush, soaking up the beautiful surroundings and sharing stories. Alternatively, guests can bask in the African sun beside the pool or escape the heat of the day with a refreshing dip. Delicious meals are served in the lounge or in the boma, a traditional fire-side meeting place, and are accompanied by an award-winning selection of Southern African wines. Weather-permitting, guests can also head into the bush for a picnic style breakfast or an early evening dinner under the stars. Geiger’s Camp is a nestled a few kilometres from the main lodge and comprises of two stone houses with four beautiful en-suite bedrooms, a large communal lounge area/library and its own swimming pool with breathtaking views of the Nhlaralumi River. Geiger's Camp is available for exclusive hire, which is perfect for groups and families. Children of all ages are welcome and may join the game drives from the age of four at the guide’s discretion. An au-pair may also be requested when making a reservation. This is a great option for families with younger children that are interested in wildlife, sensible and responsible.